The whole country has gone through one of the longest winters in living memory and it is ironic that 100 years ago Kilbeggan Races was almost cancelled because of “storm damage” to the enclosure. However, the intrepid committee, with the help of the local community, saved the day, as the “sun shone brightly” at the races. The first meeting of the year takes place next Friday evening, with 7 races starting at 5PM, with the great belief that the sun will shine again. Last year was one of the most successful years at Kilbeggan with a wonderful mix of entertainment and great jump racing The Manager, Paddy Dunican said “Last year was a great year for us, and Kilbeggan is continuing to experience a significant growth in the number of new people coming to our race meetings, with the biggest growth in attendance’s coming from group bookings, local social clubs, and business people bringing their staff and customers for a day out at our races. I’m very confident that we will continue to build on last year’s success and we are looking forward to a great new season of racing with 8 race meetings planned from now until next September”. 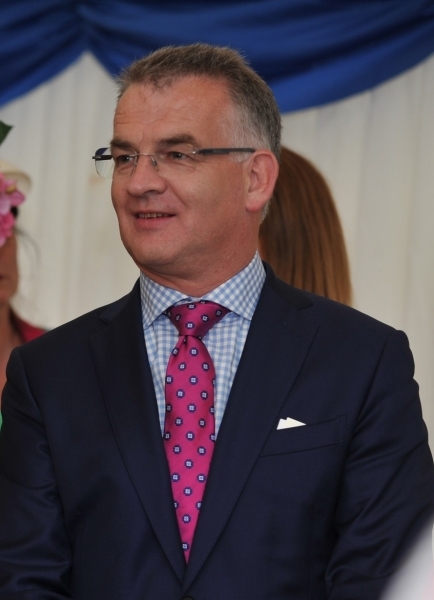 Paddy has recently been appointed a Member of the Irish National Hunt Steeple Chase Committee (INHS) & a Steward of the Irish Horse Racing Regulatory Board (IHRB). He has been short listed for the Athlone Business Person of the Year Award for all his great work in the area. He said “I am delighted and greatly appreciate the fact that I’m short listed, as one of the three Finalists for the Athlone Business Person of the Year Award, which is a great honour for me and for all the great people that support and work with me” The prestigious Athlone Chamber Business Awards Gala Dinner will take place on Saturday 21st April at the Sheraton Hotel, Athlone. What is noticeable in the last few years is that the quality of horses racing at Kilbeggan is improving on an on-going basis. Willie Mullins has had great success in Kilbeggan with horses That went on to further success like Ariel Beach (Group 1 winner, 2nd mares Champion Hurdle, listed flat winner), Whiteout(Group 1 winner Mares Champion Hurdle), Sayar (Grade 3 winner), Robin Des Foret’s(Listed winner) , Mystic Theatre (Listed winner), Court Artist and Nessun Dorma. He runs these future top class horses at Kilbeggan because the ground is always very good and safe. The best tip for this year is to watch out for his horses in novice and maiden hurdles. It should also be remembered that two of Gordon Elliot’s great stalwarts Cause of Causes and Tiger Roll won at Kilbeggan, Cause of Causes won a maiden hurdle in 2012 before his three successes (2015-17) at Cheltenham and Tiger Roll won his novice chase in Kilbeggan in 2016, which came between his three Cheltenham successes in 2014, 2017, and 2018. Could Tiger Roll win the Aintree Grand National with Davy Russell on board. The feature race at this year’s meeting is the Irish Stallion EBF Mares Nov Chase €15,000 sponsored by the European Breeders Fund supported by a good handicap chase, hurdle racing, and the bumper. In 1918 a paper stated “ as if by magic immunity from the artificiality of modern times,the Kilbeggan meeting has preserved to this day all the tenures of the old fashioned Irish race meeting –with its picturesqueness, its light heartedness, its sociability amongst the people mingling on the course”. These words still echo what Kilbeggan means to people of all ages, even more so in the modern world of the social media. If you want to see this “uniqueness” and have some fun make sure you arrive in Kilbeggan before 5PM next Friday.